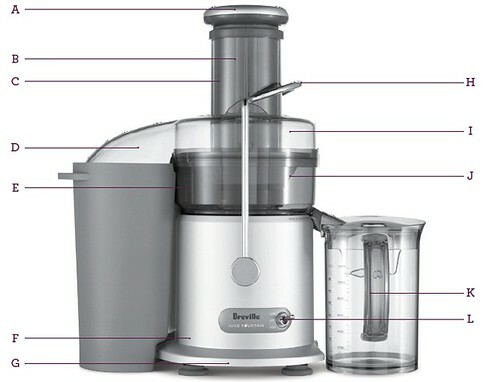 The Breville Juice Fountain® Plus — a smart juicer that adjusts speeds to maximize juice and minimize waste. 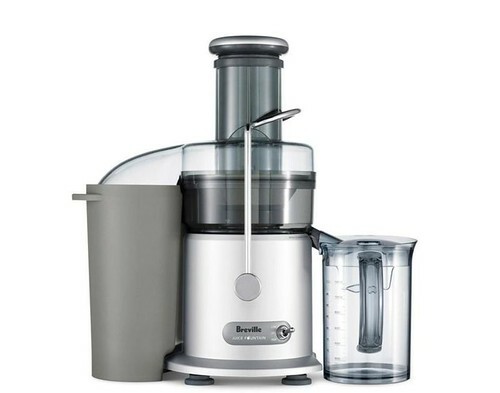 An easy-to-clean micro mesh filter keeps the fibers out and the juice in. A. Food Pusher - For pushing whole fruit and vegetables down the feed chute. B. Unique Direct Central Feed System - Ensures maximum juice extraction. C. Wide 3 inch feed chute - Fits whole fruits and vegetables. D. Large capacity pulp container. E. Nutri Disc™ - Stainless steel titanium reinforced micro mesh filter basket designed for optimum juice and nutrient extraction. F. Heavy Duty 850 watt motor. G. Cord Storage - Cord wraps around feet and clips into position under base. H. Interlocking safety arm - Stops juicer operating without cover locked in place. I. Juicer Cover. J. Filter bowl surround. K. 1 Liter juice jug and lid - With built in froth separator. L. 2 speed electronic control ON/OFF switch.